Worn over right breast pocket. 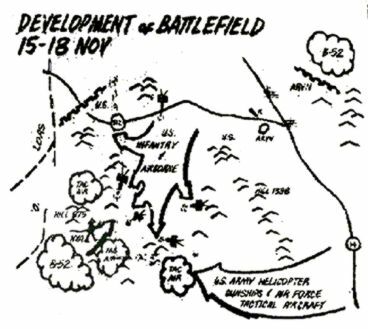 The following is a brief description of the movements and activities of Battery B from 29 November 1967 until 03 December 1967. All information is taken directly from the few Unclassified After Action- Lesson Learned Reports that we have obtained. Nothing has been added or embellished. Our goal is not to make an exciting story but to give a factual account of the Bravery of the Men of Battery B, and why this Battery received The Presidential Unit Citation. We will add more information and eye- witness accounts as they become available, we ask all our Battery B Brothers to report in with their accounts of the Battle of Dak To. The battalion has established a forward observation post in the Central Highlands on Highway 19 East and with the all Batteries of the Battalion. Forward Observation Posts has been used as intelligence sources. The Battalion is presently participating in Operation Mac Arthur, an operation it has participated in the entire reporting period. 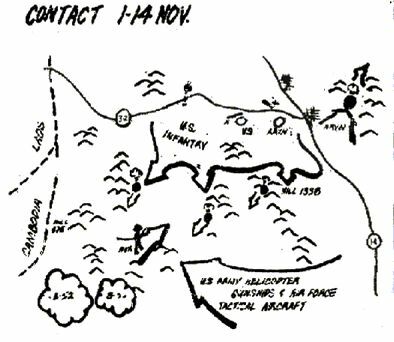 November 3rd 1967, Battery B is located at location at YB909121 in support of operation McArthur. November 4, 1967, two howitzers from Battery B at location BR123552 on Highway 19 East, displaced by road to AR981653 to conduct an artillery raid in area AR8875. Intelligence indicated that this could be a VC resupply area. During the firing of 106 HE rounds two secondary explosions were observed. The Howitzers returned to the Battery location at 1630 hours. 05 November 1967, Battery B, which had two howitzers at BR036537 and four howitzers at on Highway 19 East, displaced the entire Battery (six howitzers) by road to ZB053218 Dak TO area. The Battery closed at 1815 hours with the Mission of General Support to the 4th Infantry Division, In order to insure the security of Highway 19 East. The two remaining howitzers from Battery A (-) attached to Battery B moved to BR123552. Two Howitzers from Battery C moved by road to BR036537. (From 13th November to 03 December 1967, we haven't any unclassified information regarding Battery B) 03 December 1967, Battery B moved by Chinook and Skycrane Helicopters to LZ Satan, YB853168. The Battle of Dak To was officially over and Battery B fired over 10,000 rounds since 13 November1967. Much of the firing was at night with several missions lasting over 42 hours. The Dak TO area is a crossroads complex in the Central Highlands Province of Kontum. Army of the Republic of Vietnam Units and elements of the U.S. Special Forces-trained Civilian Irregular Defense Group. The Battle of Dak To began when it became apparent from intelligence reports that the North Vietnamese Army Units in the area were preparing battlefield positions from which to attack the Garrison at Dak To. The 4TH Infantry Division immediately deployed troops (1/92 Artillery, Battery B and PLT of Battery A (-) into the area. Additional, the 173rd Airborne Brigade was sent into the area to reinforce the 4TH Infantry Division Units. As the battlefield was developed, U.S. and ARVN troops, supported by Air Force aircraft, Army helicopter gunship and Artillery made and maintained contact with the enemy. Breaking the enemy's thrust, the U.S. Forces then pursued his withdrawal. In addition to the pressure from the ground troops and air power and artillery, B-52 Bombers struck repeatedly at the enemy support bases and along his escape routes to the west. U. S. and ARVN Forces in blocking positions in the northwest and northeast repulsed enemy units attempting to enter the battle area to relieve the pressure on the NVA elements under attack. The last major engagement was Hill 875. There the NVA chose to stand and fight for four days. U.S. Troops killed over 1208 NVA troops in those four days and 275 individual weapons and 94 crew- served weapons were captured.